postLoader, par stfour, est un utilitaire vous permettant de lancer des homebrews ou des forwarders, en autoboot ou manuellement, directement après le priiloader. Vous pouvez l'installer en autorun après le priiloader en utilisant l'option "Load/Install File" de ce dernier. * updated plugins.conf with latest corrections. * remove useless file thread locking system. * postloader require customfat (and customntfs) to be compiled (from wiiflow). Some file where missing during games/roms browsing with standard library. * new plugin managment system. Now roms are organized on per-system basis. When you select a rom, you can choose your preferred emulator. The plugin.cfg file has a new sintax. * ChannelBrowser: updated find_title_name function. Thx kuwanger!!! * changed hourglass icon with something more "modern"
* added more information if wad installation fails. * emuBrowser: up to 32768 rom can be virtually browsed. * emuBrowser: the cache file is no more fully readed in memory, but in small chunk. * emuBrowser: fixed rom count display if none or every plugin is selected in filters. * any mode can now be locked using [home]->lock this mode. Top and botton bar are disabled as well the d-pad shortcuts. * gameBrowser/gc: fixed cheat codes support for dml. Cheats files (gct) must be in the same partition of game and only '/codes' folder is supported. 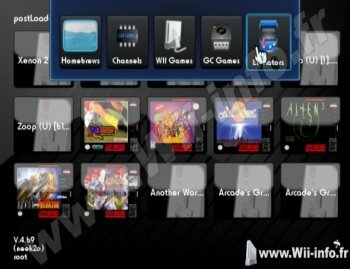 * gameBrowser: fixed wii games execution (and not required wad installation) if dml is set to auto. * gameBrowser: Automatic DM(L)/QuadForce wad installation (please, read notes carefully !!!). Thx to waninkoko WadManager 1.7 source codes. When this option is enabled (press [home] while in gamecube mode, then " "GameCube mode = DM Auto""), postLoader will choose and install the correct wad file to execute the selected gc/qf game. To use this feature, you must create a wads folder in your <dev>/ploader folder, for example usb://ploader/wads if your postloader data folder is in the usb device. Use only tested wads, from well known source. Installing these wads should be a safe operation, anyway it is a your choice. No warranty provided, no responsibility on me if you brick anything! * added a flag in plugins.conf to enable/disable plugins. Check the file! * minor fixes (also a typo in plugins.conf)..
* when a an icon is clicked, a full res cover is displayed. * added "Enable TEX cache" in "config->advanced option". If enabled a folder /ploader/tex will be created, and a rgb raw texture will be saved. This give a great boost on cover update speed but require up to 144Kb per covers on the device. Note that disabling it will remove all cached textures. appBrowser: current subfolder/page is correctly restored after executing an homebrew. appBrowser: changed format of cache. appBrowser: <long_desc> tag is read from the meta.xml when required. 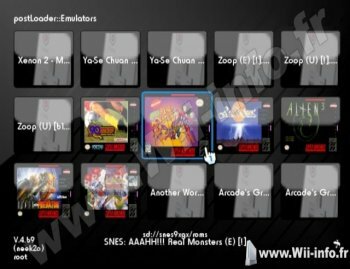 emuBrowser: fixed displaying of the same cover for multiple roms. emuBrowser: plugins.conf has a new format. Please update from full dist. AppBrowser: as requested subfolder support is back. AppBrowser: postloader setting are moved from application xml to cache system. updated readmii.txt (v1.9). Not yet complete but better then the old one. - Correction du lancement des jeux Wii depuis le mode réel vers neek2o. - L'adresse IP de la WII est maintenant affiché dans la zone "about"
MORE compatible with older neek2o versions. * usb in neek2o is now accessed via ums (thx overjoy for the info). neek2o > r86 may be required. * postloader will now write (something) on usb dev when starting. Some hdd (basically on wd elements usb 3) are really slow on first write after reloading ios. * Removed "Remove stub.bin" option. * Reset button will now switch to system menu (as it should already do...). * Fixed a dump with neek2o diconfig.bin file. * postLoader will now ask to dump your hbc stub. This is required one. You cannot do this in neek2o, as postloader must be executed by hbc to save the stub. * devolution has problems with FIX94 stub, like the old stub postloader was using (take from priiloader). Using the stub from hbc1.1.0 it works as should. This is a temporaly solution. > loader.bin must be copied in /ploader/plugins. > images must be in /games/<what you want>/game.iso (like dml). > postloader will check if a gc memory card is present, if no, emulated one is used. * adjusted roms structure (about 192Kb are saved). * added better and faster control for missing covers, so covercache thread don't need to check for them. * wiiload (network) has been rearranged to allow file of (almost) any dimension to be transferred. Now sd or usb dev are used to bufferize the transfer. With a slow sd based setup (/ploader folder on sd), some dalays are possibile. * wiiload is now compatible with TransmitMii 1.3. 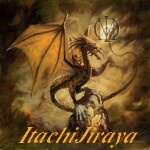 * covercache, added a cache for not existing items. This should allow much less access to devices. * semplified render process. Now only one fb is used. * moved and reduced in size the text for emulators icon. * new small font for emu icon text and filter selection. Let me know if it is readable. * d-cross up select wii games/dml. down for emu. 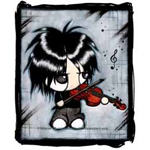 * covercache: fixed threading and now start caching current page items instead of previous one. * Now disc is checked before starting it. * Corrected a random bug that was causing the hang of cover cache thread. 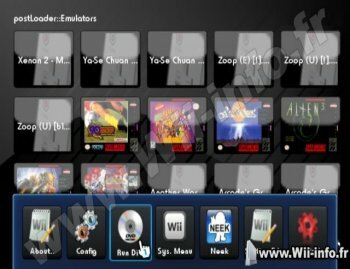 * Is no more required that the FAT32 partition dedicated to wii homebrew is the first one. * DML: added support for fst format (GCReEx) [untested]. Can be very slow on rebuilding cache, with fst games. - fixed execution of some homebrews that requires almost one arg. - added stub for returning to postloader channel when executing homebrews. - corrected a bug on creating default configuration on sd even if you shutdown/reset/return to menu when configuration menu' is showed. - postLoader was trying to patch ios 58 more than one time when browsing real nand, failing after the first. - new wbfs scan function: wbfs file are no more opened and header readed, just name of file/dir is used. 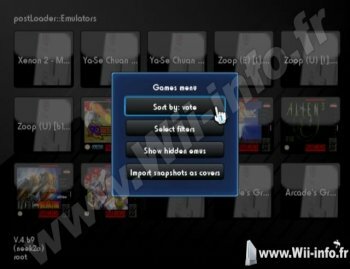 - neekbooter 1.3: neek2o mode for emunand now use WII_LaunchTitle. Should be no real difference from previus version, just smaller executable. - Corrected a possible bug on covercache thread stop shared variables. - recompiled with latest devkit/ntfs portlib. - Changed the way game loader are called. - dml: fixed the bug that could prevent displaying of games on more than one disc (from usb only)..
- postloader forwarder channel updated to v4. - Lowered to 32Kb and aligned to 32 bit the copy buffer for files. Gained some Kb/sec during game copy. - dml: sd->usb crosscheck allows 2Kb of difference to let gct codes to be stored only on sd. - neekbooter 1.2: there is an error on neekbooter 1.1. I forgot to delete 'nandpath.bin' on return to menu'. - wbfs scanner: incremented buffer size. - dml: crosscheck is done only one time per session. - dml: cross checking between sd and usb games fixed. - Again it seems that mp3 playback can hang postloader in some situations. Added a semaphore for cover cache thread. - fixed: If your last page is completely full, there will be an empty one created too. - Implemented a threaded cache system for covers. Now there aren't more pauses on page changes. - fixed channel to neek2o execution bug. Thank to AbdallahTerro to help me to track it down. - changed the way usb device is keeped live. - background music is now faded out when required. - fixed a free that was referring to mem2 address. This could probabily lead to a code dump when stopping music. - to play mp3, postloader do not use more MP3Player_PlayFile, as seems to hang postloader when multiple disc access are performed (I think disk io ins't thread safe). - channel browser: updated cover download. - postLoader doesn't use WII_LaunchTitle to execute channels on real and neek2o. CGT codes should works again in both enviroments. - postLoader will automatically copy (only one time) your vc/wiiware to pln2o nand and execute it. - THIS IS EXPERIMENTAL, make a backup of your nands before try it. - Missing from 3.59.3: AHBPROT is replaced by "+" symbol. - Changed sneek detection with joostinonline suggested one. - postLoader channel hidden also in realnand and neek. - Correction d'un bug dans les messages de debug pouvant mener à un dump corrompu si l'enregistrement était autorisé. - Certains menus ont été corrigés.Corrected some menu options. - Correction en ce qui concerne le titre en haut du navigateur de jeux (gamebrowser). - Code mis à jour. * When possibile bigger font are used. - Correction en ce qui concerne l'obscurcissement des icônes de jeux Wii. - DML: Correction d'un bug qui empêchait l'installation d'un nouveau jeu depuis l'USB si aucun espace n'était libre. - DML: Le processus de copie peut être interrompu. (Cela peut demander un peu plus de travail) (Notes : Les .iso ngc (Déjà convertis grâce à DiscEX) doivent être copiés dans ce répertoire usb://ngc folder (Première partie en FAT32). - postLoader va copier dans ce répertoire SD:/games quand cela sera nécessaire. - S'il n'y a pas d'espace libre, postLoader cous demandera si vous voulez ou non supprimer des jeux déjà présents sur celle-ci. - Base de données fileop mise à jour. - Ajout d'une sortie pour USB Gecko. - Changement de la détection pour sneek/uneek/neek2o. - La configuration p13 est écrite avant de lancer le jeu. 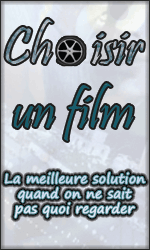 - Ajout d'un patch d'options pour la video sram. * Back to original appbooter. wiimc is instable also started from hbc (principally youtube). * Tested old appbooter with wiimc 1.2. - Correction de quelques problèmes concernant l'initialisation vidéo GRRLIB. - Ajout de priibooterGUI 0.2. - Peut lancer son propre background en .png depuis cette hiérarchie : ://ploader/priibooter.png. - Si le background disparait pendant 5 au cours de l'initialisation. Si le périphérique est déjà connecté, il disparaîtra en 3 secondes. Pendant ce temps, vous pouvez arrêter et montrer le menu de lancement en pressing n'importe quelle touche. - Le menu de lancement vous permet de sélectionner postLoader/neek/sm/hbc. Cette sélection peut être sauvegardée ou utilisée pour un usage singulier. - Utilise les mêmes thèmes que les versions précédentes pour le Menu. * if something goes wrong, an error message appear. * added ISFS/appps/postloader/boot.dol to search path (so we can read postloader from usb, compatible with neek2o and uneek) note that this make sense only under neek2o as postloader3 is capable to access usb to store data and sd can be removed. under neek an sd is required for data. * appbrowser can now manage up to 256 different homebrews. - Ajout de n2oswitch.dol dans le dossier ploader. Ce fichier doit être placé dans sd:/ploader/ pour activer la fonction neek2o nand autoswitch. Supporte automatiquement 4 nands différentes. Ces nands peuvent être sélectionnées pour n'importe quel jeu. Appuyez sur B sur la jaquette du jeu. If the region if different from default, postloader is not capable of run directly the game. So the new region system menu will be displayed with the disc inserted. * Moved "Clean channel/games configuration files..." option to "Options menu'"
* PostLoader est désormais capable de lancer un disque qui est déjà dans le lecteur. ( Appuyer sur HOME pour lancer le disque ). * Ajustement de certains messages ui. * Correction de fonctionnalité pour Wiiload après un téléchargement de jaquette(s). * Seulement les nouvelles jaquettes sont téléchargées. 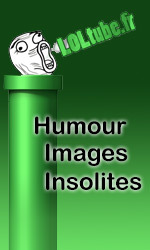 * Priibooter mis à jour en version 1.7. * Correction d'un bug qui gardait Wiiload en mode réceptif même quand les communications étaient interrompues. * readmii.txt mis à jour et possède désormais son numéro de version. * TODO: Ajout de uneek+di (cDI)à l'interface de sélection de jeu. * TODO: Plusieurs assistances à l'écran d'accueil. * TODO: Nouvelle ICÔNE !!!! * TODO: uid.sys patché sous neek. * TODO: Plusieurs options de thème. * TODO: Échange de thème pendant l'exécution. 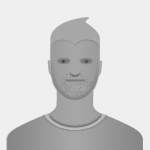 * ISSUE: Si une chaîne en format .png est corrompue, Postloader risque de "crasher". * If AHBROT is available, no more need to fall into ios249 to browse (and execute) REAL NAND titles. * If you send postLoader.dol via wiiload, postloader installation will be updated (after confirmation). * Corrected some bugs on microsneek support. Anyway microsneek must be considered experimental. 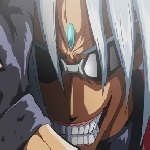 * TODO: new ICON !!!! * priibooter (if an sd is available) can run postloader/neek/system menu/hbc. It remeber last setting . * pl2: if you create on the root of sd the file postloader.log, postloader start in debugging mode. It drammatically slow. Debugging message are only partially implemented . * fixed dimension theme (you need to re-download the theme pack) . * pl2: added fix for old app with "crash on exit" issue. It is per-app setting, so press B on the app (like ftpii) and enable "Fix crash on exit" option. * pl2: hide/show application (and folders) now works as it should. * pl2: added some error message if something fails when selecting a new neek nand. * postLoader/nandbooter will try to search the nand on the first 4 partition of an hdd. It can't selected interactively, the first valid fat32 found will be mounted. * plneek.dol: added nand switching utilty to package. * pl: Added to option menu, neek nand selection and reboot items. * Added totally new version of priibooter/neekbooter, completely rewritten and now based on app_booter. * Corrected arguments passing... now if no args are found, arg struct will not be created. This solve problems related to dollz that was solved with a not-so-skilled trick in b20. * Corrected a bug on homebrew browser when hiding an application. * nandbooter: Changed default boot mode to "normal boot method"
* Change the way titles name are read from channels. Now also 'U' Loadstructor names are detected correctly. * Changed a bit usb storage initialization. * Disabled remount of devices when nand menu is choosen. * Corrected a bug on displaying icons after nand browse. * HB: AHBPROT flag is now checked. If found and current ios is 58, no reload is executed. Anyway IOS249 will be loaded when updating channels or executing them. * Corrected bug on last item of the menu. This prevents the selection of turbografx16CD and generally any last item of the menus. * Last executed title will not be dimmed. * Channel browser: Modified nand selection menu. * Corrected custom splash screen issue. * Changed "About postoloader" to "Options..."
* Added option: "Disable autorun on current device"
* Added option "Enable/Disable boot time USB initialization" when the device is an SD. * Add support for custom logo from (and only) SD. * Added on screen menu'. Press Home in interactive. Fichiers neekbooter.dol, neek2obooter.app, priiboatergui (dossier apps), plugins, forwarder et différents thèmes inclus dans l'archive. Vous savez comment on peut mettre un théme? Dernière édition le 02/02/12 à 17:45:41 par wxwx. tu a bien /apps/postloader/boot.dol ? heu oui, tu passes bien par hbc (homebrew channel) pour accéder à postloader? Dernière édition le 04/02/12 à 00:25:18 par wxwx. 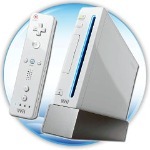 Bonsoir il permet de lancer des backups de jeux wii je crois, Non? Ou que des homebrews? Les deux, un peu tout en fait ! J'suis nouveau dans le monde Wii. j'ai une petite expérience sur le lancement d'homebrews sur d'autres consoles. Mais là, je dois avouer que malgré les tuto à foisons, ici et là, je n'arrive toujours pas à lancer un jeu iso gamecube. Je passe par postloader (der version) et j'ai ajouté avant via pimp my wii, le soft Dios mios. ( qui d'ailleurs n'apparait pas dans les hoembrews). Leur de l'utilisation de Postloader, celui m'efface litteralement mon/mes ISO qui se trouvent sur ma clef usb ( formater en fat32 et avec l'arborecence adequat). Et c'est bien là que je pige rien. Bref je tourne en rond et visiblement sur le net je n'ai pas trouvé de cas similaire. Est ce que postLoader lit les disques durs au format WBFS ?? ?